From the onset of their career, the Strypes have been on quite a musical journey. Their 2013 album Snapshot found them pumping out speedy blues-rock in the vain of their idols Dr. Feelgood and the Yardbirds. Chuck Berry-like riffs on songs like “Blue Collar Jane” helped build their dedicated fanbase, but also earned them the unfair moniker of “throwback act” from some in the music press. This would lead the Strypes to channel a more contemporary, indie pop sound on their second album Little Victories which, while it had some great songs on it, was not a great record, recorded much in the same vain as the Beatles' Beatles for Sale or the Jam’s Modern World. 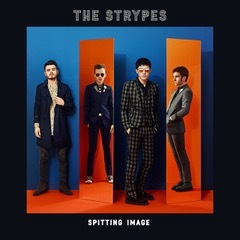 Spitting Image finds the Strypes telling the critics to shove it right where the sun don’t shine and having fun with the new wave sound of the great British groups of 1978-1982. “Behind Closed Doors” is the album opener. The song’s lyrics reflect a change in the lives of the members of the band as they transition from being teenage, Irish school boys to being a gang of Irish youngbloods and talks of nights out drinking and smoking like a proper rock ‘n’ roll band. The late ‘70s/early '80s new wave influence is quite evident on a track like “Consequence,” a song that would’ve fit in well on one of Elvis Costello’s early records with the Clovers, especially with that organ riff. There’s another reference to ‘70s British punk with “A Different Kind of Tension,” a reference to the Buzzcock’s 1979 album and song of the same name, where the band’s frontman, Ross Farrelly, shines with his reserved vocal style and bluesy harmonica playing. One of the stand out tracks on this record is “Great Expectations” with drummer, Evan Walsh’s saxophone riff and guitarist, Josh McClorey’s distinct, Phil Lynott-like guitar riff. Aside from all their punk/new wave material, the Strypes still manage to retain their blues-rock sound with the song, “Oh Cruel World,” a song that manages to produce a Bo Diddley beat and punchy, harmonica sound that the Strypes are known for. It’s a good thing for the home of the brave that Strypes have made it back to America for a few dates on the west coast. They also just announced a American tour for the spring of 2018, which includes a gig at Lincoln Hall in Chicago on April 2nd. Until then, check out this album and listen to every bootleg of this group you can find!